LE trim, Super White exterior and Ash interior. EPA 38 MPG Hwy/29 MPG City! Excellent Condition. Bluetooth®, CD Player, Back-Up Camera, iPod/MP3 Input, Galpin's Lifetime Used Car Warranty, KBB.com explains "..the 5-passenger 2015 Toyota Corolla sedan continues to offer buyers a solid, dependable compact Car delivering good fuel economy at an affordable price.". Back-Up Camera, iPod/MP3 Input, Bluetooth®, CD Player MP3 Player, Keyless Entry, Remote Trunk Release, Child Safety Locks, Steering Wheel Controls. Toyota LE with Super White exterior and Ash interior features a 4 Cylinder Engine with 132 HP at 6000 RPM*. 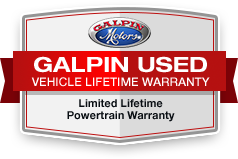 Galpin's Lifetime Used Car Warranty.